Tony draws out the best to suit your needs! Choosing art is a personal thing. No different with cartoons and commercial drawings. And the more choices you have the easier it is for you. Especially with Tony’s ‘one-stop’ cartoon and commercial art shop. 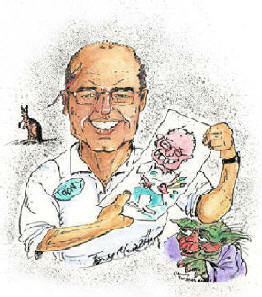 For comic strips, ‘spot’ cartoons, editorial cartoons, magazines, instruction booklets, leaflets, and so forth, Tony Murphy draws out the best to suit your needs. Punch-lines (Ideas for punch lines you can't seem to crack).